Portland, ME - Vinnie “Diane” (Anderson) Howell died on October 9, 2018, after years of living with dementia and congestive heart failure. Diane (nee Patricia Matthieu) was born on November 8, 1933 and was adopted by Mildred and William Anderson shortly after her birth. She was named Vinnie Diane Anderson by her adoptive parents, and years later, would be known by her middle name, Diane. She attended South Portland schools and graduated from South Portland High School in the Class of 1950. 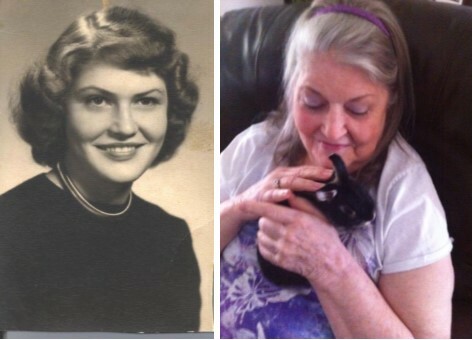 She loved to read, play piano and was an amazing singer and artist. She adored fashion and always dressed beautifully. She married John “Jack” Howell in 1952, and they had three children: John William, Bonnie Ann and Mark Allen Howell. They resided in South Portland but divorced in 1961. As a single mom, Diane worked hard to give her children a good life, and her parents were amazingly supportive in helping raise her children. In 1962, she had another child, Donna Marie, which they helped raise as well. She had many jobs throughout her life but was most proud of her job as a legal secretary with the City of Portland Corporation Counsel. After leaving that position, she worked at USM in Gorham as an administrative assistant and retired in 1998. After retirement, she lived a simple life, and continued her quest for “bargains”, shopping her favorite thrift shops and lawn sales. She was fiercely independent and her thriftiness enabled her a comfortable retirement. She was blessed with a quick wit and a great sense of humor. Once diagnosed with dementia and congestive heart failure in 2013, she lived her final years under the care of her daughter Donna and her son-in-law, Dale Baker. Dale’s ability to work from home made it possible for her to avoid nursing home care, and they had an amazingly close relationship. She was predeceased by her parents and her grandson, Jason Howell, and leaves behind her children John of Standish, Bonnie of Portland, Mark and his wife Tina of Georgia, Donna and her husband Dale of Portland, grandchildren Heather Howell, Stephanie Howell Seavey, Felicia Tenney, Kristina O’Brien, Sean Baker and Corey Baker,13 great grandchildren, and 2 great-great grandchildren. Her family would like to acknowledge the wonderful care she received by VNA Hospice nurses, and the nurses and staff at The Barron Center, Second Floor, South Wing during her final journey. There will be a graveside service at Pine Grove Cemetery in Falmouth on Thursday, October 18, 2018 @ 2:00 pm. A gathering will be held at the family home after the service at 28 Sewall Street in Portland.